Die Kernkompetenz von Bender ist elektrische Sicherheit. Wir stehen Ihnen mit unserem Wissen und unserer Erfahrung rund ums Thema elektrische Sicherheit zur Seite. Nehmen Sie weltweit Kontakt mit uns auf! 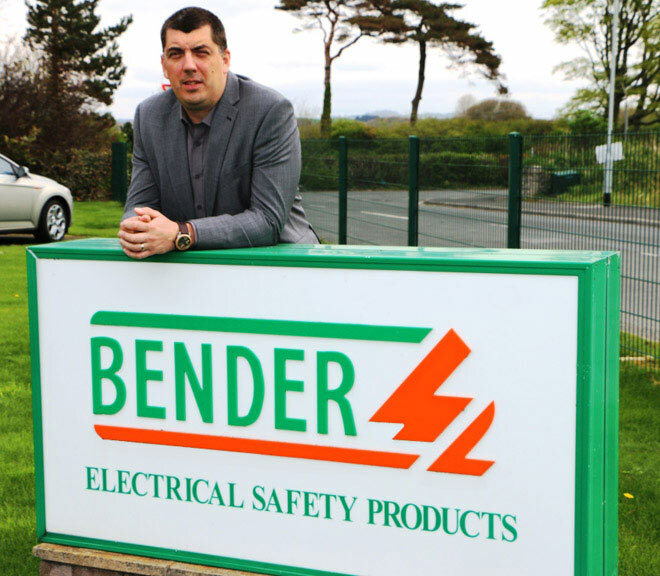 Bender UK is now responsible for the supply, installation and support of its Electrical Safety and Healthcare products across the Republic of Ireland as well as Northern Ireland. Bender UK offers proven capability and expertise for users of critical power systems across sectors spanning healthcare, defence, data management, manufacturing, rail, power transmission, renewable energy & electric vehicles, and a range of core products and services including residual current monitoring (RCM) units and advanced on-line earth fault location, power quality management (PQM) & remote monitoring, and Insulation monitoring Bender UK Managing Director Steve Mason explains: “Bender is a world leader in electrical safety and power management systems and we harness that technology creating tailored solutions which precisely meet the needs of customers who simply cannot afford their power systems to fail. We work with them to ensure maximum availability and total safety while also helping to manage power consumptions and reduce costs. All enquiries for Bender products and contact information for Chris Simmons should be directed to the Bender UK office as normal telephone +44 (0)1229 480123.